Today's post will discuss the transition from quilting to making clothing. I know there are a lot of you out there who think that you can't sew for your own body or others.....my response is, "Yes, you can!" Think of it in a way you never have before...quilting is all about accuracy. That 1/4" seam eats me up whenever I am in the middle of trying to piece something together! Making clothing is much more forgiving. For one, you have a bigger seam allowance (I allow 1/2"), so you can fudge things a bit if needed. For example, if you have to make one seam a little bigger or smaller than another, the end result will not reflect that...think of it as altering the pattern to fit you best! Of course, I know that is the part that intimidates some of you....so keep this mantra in mind when making clothing for yourself, "To thine own self be true". "Why this phrase? ", you ask....because the first thing you have to do if you want to make something that fits you well is measure yourself! I know....it can be scary to actually attach numbers to parts of your body, but let's face it. We are all different sizes and that is what makes everyone unique. So let's embrace that uniqueness and get going! My advice for making the transition from quilting to clothing is to make something simple and fast. You don't get simpler or faster than a skirt. There is no crotch to deal with or pesky inset pockets. It is a good way to get introduced to interfacing, facings, and adding zippers. 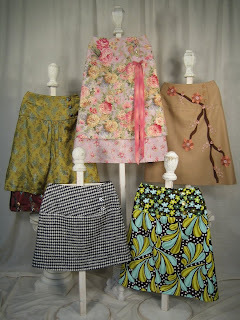 Plus if you have to alter a skirt, it is relatively easy to do. My designs for skirts are in 2 basic shapes....straight and A-line. A lot of people find that A-line skirts are great to get started as they look good on any body shape. It must be that "float away from the body" characteristic they all share! Below is a photo of our Tiffany Skirt....it is an A-line made with raw edge construction so the scallops sort of fray after washing and wearing a bit....really fun and sure to draw in the compliments. 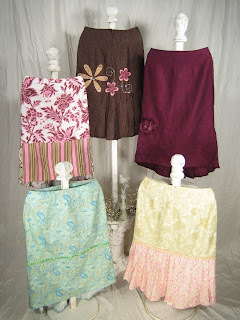 Next is our Bella Skirt, also an A-line with a lined yoke. It offers a front buttoned closure, so you don't even have to put in a zipper on this one! You can layer coordinated fabrics to show off those special 2-3 prints you bought at your local shop. Straight skirts are great for those body types that are somewhat curvy (to show off your assets) or fairly straight (where your waist is not a lot smaller than your hips). For the straight folks, these types of skirts can give the illusion of curves! Below is our Kendra Skirt. It is straight with a flirty dip in the hemline at the back. Back to that measuring thing.....for a skirt you only need two basic measurements....waist and hips. I recommend in my patterns that you go with the hip measurement and alter the waist if needed. Let's say for the sake of example that you are 42" in the hips but 34" in the waist....the pattern says for that hip size that you should be 32" in the waist...uh oh, that doesn't match your measurement....no problem! Then next size up is 34" in the waist, so what you would do is combine these two sizes. It sounds hard but is truly a cinch. All you would do is keep all of the sizes intact when cutting out the tissue. Then, use the size with the 34" waist and TAPER the side gradually down to the 42" hip size. Just fold the tissue to taper and there you have it. I also suggest that you make a muslin...what is that? A muslin is an article of clothing that you make as a test run...it doesn't have to be made out of muslin literally. Let's say that you have an ugly piece of fabric that you wonder why you thought it was so great when you bought it (maybe it was on sale)....use it! This is a test piece anyway before moving on to that fabulous fabric that you just had to buy! Why make a muslin? It is a great way to make any other alterations....maybe you will need to take more from the front seams or side seams or add to the length....this piece will allow you to test all of these things, MAKE NOTES of changes, and then use these notes to make your "real" skirt. Not only can this be accomplished for you, but for anyone else you want to sew for. I have done this many times and the results are fantastic! Fabric choices.....ah, one of my favorite parts! There are so many wonderful fabrics in the quilt shops these days.....those funky color combinations and large scale prints are just the best for clothing. Plus they are all cotton and can be washed without having to worry about what they will do when put in the washer. Making clothing from large scale prints is fun because your pieces are larger and you aren't disrupting the pattern in the fabric as much....it is time for those fabric designs to shine! Think of how proud you will be when that first compliment comes your way....you can brag about how you made it yourself and how easy and fun it was! I promise...making these things can be addictive!! Soon you will be thinking about how many more you can cram into your wardrobe in this color or that. Get creative! 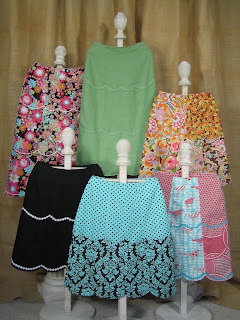 Make your skirt from several coordinating fabrics, add simple applique designs, machine embroidery, ribbons, trims....the possibilities are endless! Once you get going, you will wonder why you waited so long! Being brave has its payoff!